A month of free Christmas celebrations has officially commenced in Melbourne with the lighting of the Christmas Tree in the City Square on 30 November by Deputy Lord Mayor Susan Riley and Santa. Giant Christmas decorations appear on our city buildings and streets. Christmas decorations are turned on and dramatic projections appeared on Melbourne Town Hall. 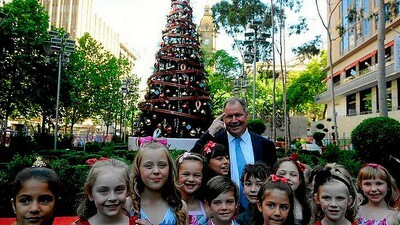 I caught up with the City of Melbourne to find out what they have in store for the 2012 Christmas Festival. It maintains the range of free and fun activities offered in the 2011 festival, however it also includes a number of cool, interactive features such as QR coded gift boxes spread around the city offering discounts to shoppers as well as digital displays such as animated light shows, a digital nativity scene and projections on Town Hall. Lord Mayor Robert Doyle invites residents and visitors to come to Melbourne and see the city come alive with the colours of Christmas and to enjoy a number of free and fun activities. Here are the main highlights over the next 30 days. To all my readers and your families, A Merry Christmas! And Merry Christmas Melbourne! Located next to Westin Hotel and popular dining venues like La Vita Buona Wine Bar, Caboose Canteen and Brunetti , City Square is transformed into the Christmas Square, the home of Christmas in Melbourne. The runway of the Melbourne Spring Fashion Week has been transformed into a magical Christmas forest, complete with giant gift boxes, festive landscaping to entertain children and adults alike, and a maze where children can find Rudolph and his reindeer friends. At the heart of Christmas Square is a beautifully decorated 9.2 metre living Xmas tree which lights up daily after the sun sets. It is the stage for photographs with the family and friends. Lord Mayor Robert Doyle shared that Christmas is a special time for families across Melbourne and so it is wonderful to celebrate the festive period with such a magical display. The Christmas Square presents free daily sound and light shows at 9.30pm and 11.30pm till 2 January 2013. The lobby lounge at Westin that overlooks the Square provides an excellent venue to enjoy the show over a drink. An estimated 1.2 million adults and children visit the Myer's Christmas Windows at Bourke Street each year and 2012 is no exception. It has become a Melbourne Christmas institution over 57 years and a festive highlight of families. This 2012 Myer Christmas Windows is based on Russell's Christmas Magic, a popular children's book. The animated windows will entertain daily from 9 November 2012 to 6 January 2013 between 7.30am to 1am daily with sound stopping at 10pm. Everyone can post Santa a letter with their Christmas wishes from 16 November to 16 December. Santa's Post Box, supported by Australia Post, has returned to give children speedier access to Santa than the Eureka Skydeck postbox. Simply include your postal address and a stamped envelope with your wish to receive a reply from Santa. I'm sure the good folks at UNAA VIC, Starlight Foundation, Leukemia Foundation and Refugee support groups will be hoping for kind wishes from Santa. Wonderland Fun Park in Docklands' Harbour Town has been transformed into a Christmas north pole village, complete with an enchanted forest, make-a-wish tree and Santa's mailbox from 17 to 24 November. This inner-city fun park offering rides and attractions throughout the year is celebrating the festive season as Santa's Magical Wonderland. There are daily snowfalls, appearances by Santa and his friends throughout the day and a Santa's Circus Spectacular Show in the Wonderland Spiegeltent Theatre where acrobatic elves perform amazing tricks and the beautiful snow angel deliver acts of aerial delight. Show tickets are AUD10 online and AUD15 at the ticket box. Various passes are available from AUD15 to AUD35 that include rides and photographs with Santa and his helpers. Melbourne's beloved central municipal building has been transformed for Xmas by world-class projection designers, The Electric Canvas. The office of the Melbourne City Council and venue for many events including theatrical performances, concerts and exhibitions is gift-wrapped and decorated with giant toy soldiers. As night falls, the Melbourne Town Hall becomes the facade for a spectacular festive light and show projection with scenes that change before your eyes. Make a date with the Melbourne Town Hall between 9pm till late from 30 November to 25 December 2012. It may not be Christmas Light Up on Orchard Road but Melbourne has come alive with Xmas decorations spread around the city from 30 November 2012 to 4 January 2013. You will come across different Xmas decorations as you wander up Swanston Street into Chinatown and further up into Lygon Street, Kensington and North Melbourne. The Bourke Street Mall is transformed by glittering stars and giant mistletoes while 800 jingle bells form the all-new sound and light centrepiece on Bourke Street. Further information on the Xmas decorations are available at the Information Booth in the Bourke Street Mall. It wouldn't be Christmas without Santa. As the home of Christmas in Melbourne, children can meet the jolly old St Nick and share with him their Xmas wishes daily between 10am to 12pm and 1pm to 3pm. It is also an opportunity for free photographs with Santa. This special Christmas Square residence of Santa is open from 1 to 24 December 2012. On 3 December at 10.30 am, Reverend Jim Barr of the Melbourne Welsh Church performed a Christian blessing of the Christmas Square Nativity Scene accompanied by traditional Christmas carols. Lord Mayor Robert Doyle shared that the Christmas Festival shows the City of Melbourne‟s commitment to city businesses. Christmas is an important time of year for the retail and hospitality industries and he encourages visitors to stay in the city for a spot of shopping and to grab a bite to eat at the many restaurants and cafes this Christmas. Check out the special festive offers from retailers like GolfTec and Lord Coconut, and entertainment/dining venues like Melbourne Ice Lounge and Longrain. There are also Xmas Day Lunch specials for readers from Melbourne Marriott's Essence on Exhibition as well as attractive hotel stay packages.